Tripadvisor.com has thirteen suggestions under “Things to do in Kuwait City.” The top four are not surprising, the aquarium, the Grand Mosque (though it’s currently closed for repairs, so we will not be seeing it), the Kuwait Towers (also closed for repairs, so not to be seen by us), and Tareq Rajab Museum of Islamic Arts (which we loved and you can read about it here: Gems & Germs: Exploring Kuwait’s Tourism Side). The fifth most recommended thing to do in Kuwait City is to visit the Mirror House; essentially go have tea with Ms. Lidia. When someone says “The Mirror House,” maybe your head is filled with images of a Mad-Hatter, carnivalesque, Mrs.-Haversham-type residence. And you wouldn’t be far off. Ms. Lidia al-Qattan is the owner of and creative genius behind the Mirror House. She is the widow of Khalifa al-Qattan, a famous Kuwaiti artist. She has lived in Kuwait since the 1960s and throughout these last fifty years has turned her house into a showpiece like no other. 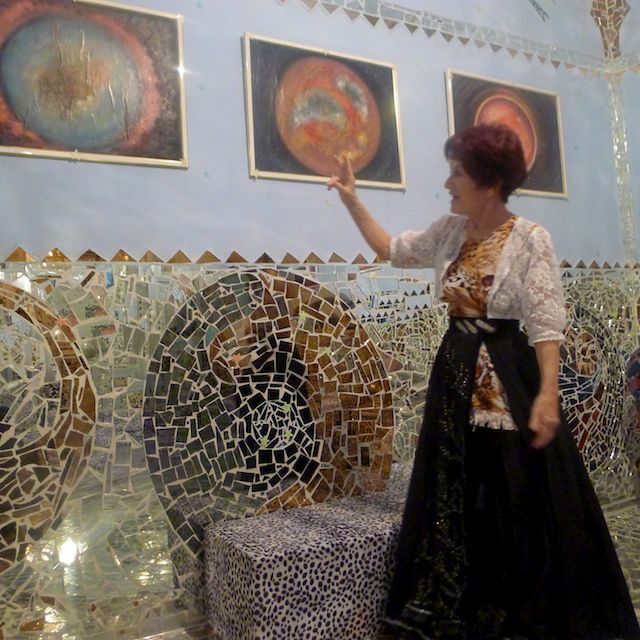 The Mirror House is literally covered from top to toes, inside and outside, with intricate mirror mosaics that she has personally designed and created all on her own. When friends and I went to visit her she welcomed us in like long-lost friends. But, like rude long-lost friends, I barely even noticed her as I was too busy gaping at everything around me. Even the outside wall surrounding her home is decorated in mosaics. There were mirror-mosaic butterflies and deer prancing around the inner courtyard. And if that wasn’t distracting enough, then we actually entered her home. Barely an ounce of floor or wall-space was left un-mirrored. Everything glittered and shimmered with mirror bits. She had laid out cake and biscuits and juice for us, so we sat on the mirrored bench in front of the mirrored tables aligning the mirrored wall and tried to remember to blink as we soaked in the sights and listened to the history of the house. When she and her husband moved in to the house in the 1960s, they were the only one in the area. The Qadisiya neighborhood is now just as crowded as the rest of Kuwait City, with villas bumping up to villas. She studied nursing in London, but always had a penchant for art. And when her husband was away on a business trip once, she created a small mirrored-mosaic statue for him on a whim. And it sparked an interest that would last for the next fifty years. She explained all about how she tried different bonding agents, finding some too rough, others too weak, and some that were too hard to keep clean, and finally settled on her current mixture. She told us the heart-breaking story of discovering termites in the walls and floors and having to rip out all her work to fix the problem. Not to be undeterred, however, she re-did all the mosaics, and added even more. As the tour of the house started, she took us room by room, explaining the different themes present, the beginning of the world, the solar system, astrological signs, and everywhere there were animals present, from swans and eagles, to sting rays and dolphins, to camels and even a unicorn. I had brought my 14-month-old daughter along with us and she was quite mesmerized by all the sparkly bits. Lidia kept telling me to, “Let her go, let her explore,” which I did with great trepidation. Inevitably, Bean would gravitate with great eagerness to one of the many glowing spheres perched on stands and Lidia would laugh and say, “Oh, it won’t hurt her.” “Oh, I’m not concerned that it’ll hurt her,” I’d say, as I prevented her, yet again, from knocking some one-of-a-kind artwork to shatters on the ground. 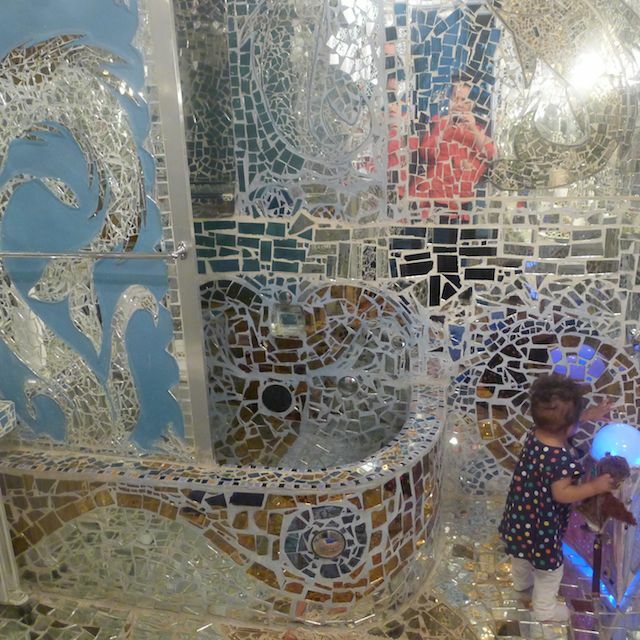 In hindsight, bringing a toddler to a “mirror house” might have been a dumb move. Lidia loved telling us the stories that inspired her for each room, and we would dutifully sit on the cushions, perched on the mirrored banquets and listen. And in many rooms there were added light features, so she’d turn off the lights and the solar system would light up, or the paintings would flicker on. Going from room to room was like visiting a string of mini planetariums, without all the fussy facts. I think I was most fascinated by the bathroom, in which every inch was covered by mirrors; from the sink, to the shower stall, to the trash can, light switch, radiator cover, and even toilet brush holder. Nothing was left un-mirrored. And if you stood in the middle of the room, the walls and floor almost became two dimensional, losing all sense of depth. Might be a little too much to deal with early in the morning. Upstairs there were a few rooms displaying Mr. al-Qattan’s paintings as well as Lidia’s other artistic endeavors. One room was covered in industrial carpet that she’d painted and for thirty minutes she kept us there throwing velcro’d papier-mâché tiles at the wall and kept saying, “No, they're not in a line,” or “Nope, not facing up,” and then she’d hand them back to us and we’d throw them again. Despite our appalling lack of papier-mâché-tile throwing ability, she finally let us out, but not without a slight sign of disappointment, I’m sure. For over an hour, Lidia opened her home to us and shared her stories and her amazing creations and endless visions. We felt so welcome. It was like visiting a favorite aunt; you wanted to stay for days (but maybe not with a toddler). As we left, we bid her farewell, and thanked her repeatedly for her gracious hospitality. It was absolutely one of the most delightful outings we’ve had in Kuwait. So, now I think it’s time I jot off a quick note to tripadvisor.com and inform them that they need to seriously revise their ranking of “Things to do in Kuwait.” Without question, having tea with Ms. Lidia should be number one. So, for anyone who finds themselves in Kuwait and is looking to visit Ms. Lidia, it’s requested that you call ahead (+965-22518522) to make an appointment; this is her home, after all. At the end of the tour, which can easily last over an hour, she asks for a small donation (2kd on weekdays, 3kd on weekends). And bring a token of your appreciation, dates or cookies or something you’ve made. Believe me, at the end you will wish you’ve given her more.